Congratulations to all our participants who competed in the recently concluded Synopsys Science, Engineering & Technology Championships. Special congratulations to Terry H. and Himani M. for being named among the award winners. 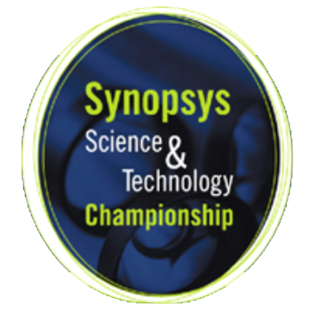 The nature of the awards will be specified, at the Synopsys Championship Awards Ceremony to be held on April 7th at the Campbell Heritage Theater. 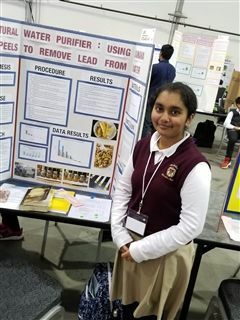 Hmani's has been selected to represent Santa Clara County at the State Fair in Los Angeles later this term. Again congratulations to all out students who participated in this event. The annual Synopsys Championship showcases students in the Santa Clara County of California who will become our future scientists, technology experts, engineers, and mathematicians. This regional competition celebrates achievement by middle and high school students supported by their parents, teachers, and schools. Through the annual competition, hundreds of the area’s students are challenged to go beyond their classroom studies to do independent project-based research. They work independently or in teams to address questions in the fields of Computer Science, Environmental Science, Medicine & Health, Chemistry, Biology, and a half dozen other categories. "Natural Water Purifier: Using Banana Peels to Remove Lead From Water"